1 box of chocolate cake (and ingredients needed for cake). 1 8oz tub of cool whip. 1 30 oz can of Cherry pie filling. 2 teaspoons of pumpkin spice. Prepare cake according to directions on box, adding pumpkin spice to cake batter before baking. Add red and yellow food coloring to cool whip, until desired orange hue is achieved. (I did 5 yellow, 3 red.) Gently fold in colors. Once cake has cooled, gently cut cake into one inch pieces. 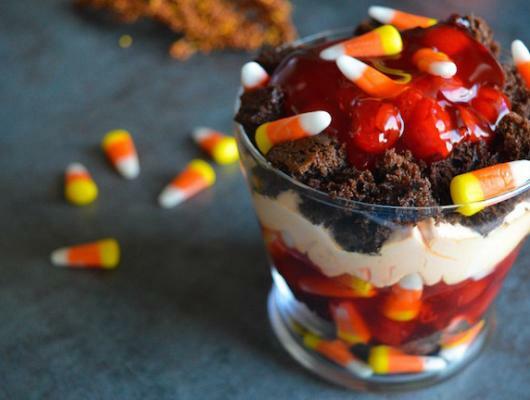 In a large glass serving bowl (or smaller containers), you’re going to layer the bottom with candy corn (as desired –I did outer edges), cake, cool whip, cherries. Continue process until ingredients are finished and you’ve reached the top. This is a basic Fall trifle, you can add additional flavors such as caramel pudding, or chocolate pudding. Add additional candy corn on top to make it “pop” more. Halloween is almost here & the first thing I think of is candy corn. 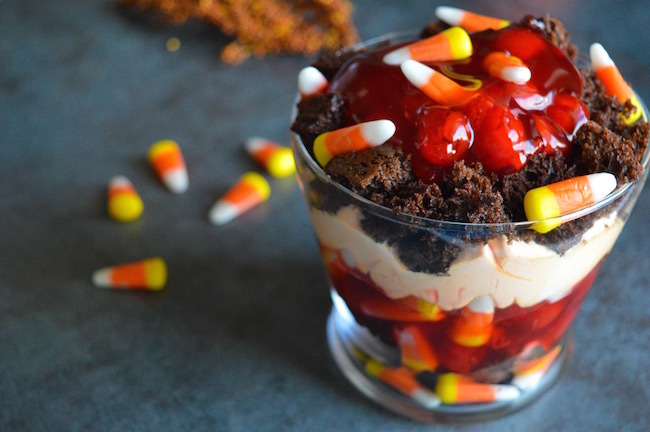 This Candy Corn Trifle recipe is perfect for this time of year. Fall Trifle, Thanksgiving Trifle, Individual serving Trifle.